An experienced manager will now head the specialised UN agency and international financial institution dedicated to eradicating rural poverty. 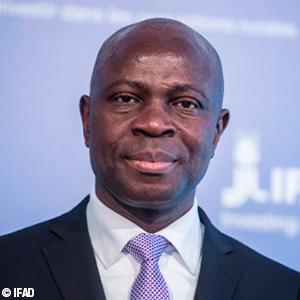 On 14 February 2017, the former Prime Minister of Togo, Gilbert Fossoun Houngbo, was appointed as the sixth president of the International Fund for Agricultural Development (IFAD) for a four-year mandate. He is the second West African to occupy this position, following the Nigerian Kanayo Nwanze. Houngbo is a recognised expert in international development, diplomacy and financial management. He began his career at Price Waterhouse, Canada, where he worked as a specialist in financial sustainability, operations and auditing. He then worked for the United Nations Development Programme (UNDP) as the director of finance and administration. In 2003, he was appointed the UNDP chief of staff and subsequently held positions as the Assistant Secretary-General and the administrator of the UNDP. Later in 2005, he was nominated as the director of the UNDP Regional Bureau for Africa, in charge of 1 500 staff. Less well known in his home country, his appointment as Prime Minister under the presidency of President Faure Gnassingbe (2008-12) came as a surprise to many. He quickly gained a reputation to be a “man of consensus,” and was also known for leading Togo on many economic and social reforms, such as the IMF debt relief programme for heavily indebted poor countries (HIPC). In 2013, Houngbo returned to the international scene, this time as deputy director-general for field operations and partnership at the International Labour Organization (ILO). The governments of the African Union unanimously endorsed Houngbo’s candidacy. “I have come from the rural world. I have first-hand knowledge of the harshness of this kind of life,” Houngbo declared. Born in 1961 in Agbandi, in central Togo, Houngbo holds an advanced degree in business management from the Université de Lomé (Togo), and a Bachelor of Arts and DESS (Diplôme d’études supérieures specialisées) in accounting and finance from the Université du Québec à Trois-Rivières (Canada). With Houngbo, IFAD gains an experienced and prudent manager. “We have to keep our ambition, and, at the same time, be realistic and pragmatic. We have to demonstrate that every dollar invested will have the highest value for money,” Houngbo announced following his appointment.